Polishcoaldaily‘s Founder and Former Editor’s comment on the one of ideas by Polish Ministry of Energy with Ministry of Entrepreneurship and Technology on how to fight with the smog. Is screening really can help in making air in Poland less polluted? Polishcoaldaily‘s Founder and Former Editor gave a full interview in Ekonomia Raport by TV Republika on Wednesday, talking about steam and coking coal prices after disaster in Zofiowka mine, plans for the nuclear energy and anti-smog policies by Polish government. Polish rescue workers found the bodies of two miners after a rockburst hit on Saturday a coal mine in southern Poland, owned by Jastrzebska Spolka Weglowa. Polishcoaldaily‘s Founder and former Editor short comment for Polish Radio24 on the subject. Despite difficult regulatory conditions in EU, Poland remains the largest coal consumer on the continent. Almost 90% of the country’s power generation comes from coal. As a net importer, Poland continues to look to the international market to meet their energy demand where domestic supply falls short. As Energetyka24 published its survey about air pollution in Poland, which shows great misconception about the subject among common folks, Polishcoaldaily‘s Founder and former Editor rush along to bust some myths in the latest article for Biznes Alert. Chinese National Development & Reform Commission plans to create several “super-large” coal mining companies by the end of 2020 as the world’s biggest producer of the fuel ramps up years of efforts to streamline the fragmented sector and slash outdated capacity. In recent months there has been some rumours, that Philips Lighting (a hegemon in the Polish LED business) is leaving the Central Europe market to move their operations elsewhere, and that the Dutch has already made a sales offer of their assets to a Canadian company. In mid-2017, JSW signed a letter of intent with 3 construction companies regarding cooperation to identify the possibility of building a pumped hydroelectric energy storage in soon-to-be-closed Krupinski mine. Polishcoaldaily‘s Founder and former Editor comment for K. Baca-Pogorzelska’s story. TG: DO WE HAVE TO CHASE THE MEGATRENDS? There are trends and developments in the energy industry that most observers agree are likely to be around for the long term, which are called ‘megatrends’. One of them is a trend of moving towards renewable energy and leaving fossils. But do we necessarily have to meet them as soon as possible? “Energy, climate, revolution” – that’s the new slogan of entirely new reo.pl, which just started two days ago with the new staff behind it: P. Wojcik (Gazeta Polska Codziennie), W. Jurasz (former ambassador of Poland to Venezuela), R. Sznepf (former ambassador of Poland to Paraguay) and Polishcoaldaily‘s Founder. In following months a new bill will be introduced, which will allow the 2.5k municipalities in Poland to reclaim ownership of street lighting from energy companies. This will allow them to modernize their systems in order to obtain savings for taxpayers. Polishcoaldaily‘s Founder and former Editor cover of the recent Pomeranian Regional Assembly, where councillors discussed the appropriate approach towards the fight against the polluted air, which should not turn into a fight against coal – as majority of them are convinced to. Polishcoaldaily‘s Founder and former Editor in an interview by Dorota M. Zielinska, explaining how he got into energy sector, how can he cooperate with eco-enthusiast while he himself is known as rather eco-sceptic and what happened in the dynamics between him and Centre of Analysis of the Jagiellonian Club? In the name of Chamber of Polish Coal Traders, Polishcoaldaily‘s Founder and former Editor was addressing councillors of Pomeranian Regional Assembly on the appropriate approach towards the fight against the polluted air, which should not turn into a fight against coal. Polishcoaldaily‘s Founder and former Editor was invited by Krzysztof Skowroński to Radio Wnet morning programme to talk a little about the smog, which was recently a cause of yet another clash between European Union and Polish government, as the EU court says Poland violated air quality laws in 2007-2015. By 31st October around 5k largest Polish companies had to present in the Energy Regulatory Office the results of their mandatory energy audits. What were the main issues connected with the new law and will happen next in the area of energy efficiency in these companies? Polishcoaldaily‘s Founder and former Editor introducing his new column in reo.pl called Energy Simmetrist, which will be almost entirely focused on energy efficiency issues and how it can help adress the eco-challenges in the following years. NETTG: QUANTITY, QUALITY OR PERFORMANCE? As the more and more clients of PGG complain about undelivered coal (recently Arcelor Mittal), the discussion on the performance of Silesian mines goes on. With weak performance, there is no justification for sustaining production in some mines. But what about the quality of coal in Silesian deposits? 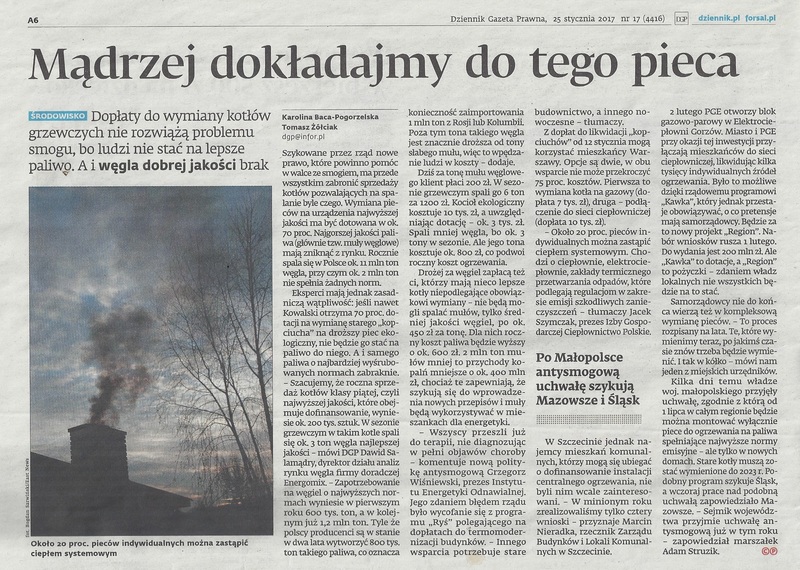 Polishcoaldaily‘s Founder and former Editor’s comment for report by Karolina Baca-Pogorzelska and Zofia Jozwiak in Tygodnik Gazeta Prawna on the subject of thermo-modernization, which in his opinion should be the top priority when facing the issue of air pollution. Polishcoaldaily’s Founder and former Editor took part in the meeting of Parliamentary Commission for Mining and Energy, where he had the chance to point out many lies made by Polish Smog Alarm, which blames coal for air pollution using unfair accusations. Polishcoaldaily‘s Founder and former Editor’s coverage from the recent meeting of Parliamentary Commission for Mining and Energy, where Secretary of State Chief National Geologist Mariusz Orion Jędrysek Prof., PhD was presenting the new government’s natural resource policy. Coverage from the last meeting of Parliamentary Commission for Mining and Energy, which this time was dedicated to governmental battle against the air pollution using thermo-modernization of public and private buildings and not necessarily fighting against coal. Polishcoaldaily’s Founder and former Editor commenting in the latest article by Karolina-Baca Pogorzelska in Dziennik Gazeta Prawna (Daily Legal Newspaper) the situation over energy audits, as the Energy Regulatory Office announced that only 3,5k companies carried out their duty. A short list of totally forbidden arguments and figures of speech used by some commentators while discussing the energy issues. Remember the ratio legis, avoid loopholes in your reasoning and never ever try to blackmail your opponents. Polishcoaldaily‘s Founder and former Editor commenting in the latest article by Karolina-Baca Pogorzelska in Dziennik Gazeta Prawna (Daily Legal Newspaper) the situation over energy audits, which were runned poorely, both due to the imperfect law and irresponsible companies. Polishcoaldaily‘s Founder and former Editor as always took part in the another meeting of Parliamentary Commission for Mining and Energy, where he took the opportunity to rectify some false theses of global coal abandoning, made by many experts during the debate. Polishcoaldaily‘s Founder and former Edtor quoted by Biznes Alert, in Teresa Wojcik’s coverage of the last meeting of Parliamentary Commision for Mining and Energy, where he stated that despite so called “megatrends”, Chinese and Singaporean banks are investing in coal projects. Polishcoaldaily Founder’s coverage on the last meeting of Parliamentary Commission for Mining and Energy, where Polish politicians, professionals, academics, experts and lobbyists discussed what should be presented in Katowice during climate summit on December. New deputy minister focused entirely on polluted air, mixing terminology on the causes of smog in the largest Polish cities made by so called “smog experts” and many more in the latest article by Polishcoaldaily’s Founder and former Editor. United Kingdom plans to shut down all of its coal-fired power plants by 2025 with the 450g CO2/t limit laws (similar to EU “Winter Package”), but this decission is completely irrelevant on the ideological level of the discussion, since it is caused mainly because of market reasons, not the politics. Second article by Polishcoaldaily’s Founder and former Editor for reo.pl (run by Renewable Energy Market Foundation), this time on the relationship between renewable energy (with its grid priority dispatch) and fossil fuels (with its capacity market) in Polish energy mix.